Sometimes, there are albums that seem to be complex to our senses, and if you’re a writer, it becomes a hard labor like those that Heracles faced in Greek mythology. But as well, the more an album is complex, the more you’ll like it, and this is the case of the Swedish trio SOIJL. Their new album, “As the Sun Sets on Life” is really very good. Their musical work is focused on a very melodic and melancholic form of Doom Metal using grunted voices and some experimental touches and influences. Obviously it is bitter and harsh in many moments, but the more you get used to their musical work, the more you’ll understand and your senses becomes opened for what the band has to offer. You’ll hear a bitter and oppressive form of music, but elegant and with some good female vocals as well (a courtesy of Miriam Karlsson). Mattias Svensson is the album’s producer. Initially, the band was planned to be a side project of Mattias, so he knows and have the clear idea of what he wants of the sound quality. It’s not perfect, because it is a bit rawer than the needed, but it is heavy and has that balance between weight, aggressiveness and clarity in a very good level. The seven long songs of “As the Sun Sets on Life” are very good, but as their finest moments, I’d like to name the bitter and darkened “Death Do Us Part” with its deep introspective feeling and fine guitar work, the funeral paced song “Salvation, Deception”, the contrast between nasty vocals and good clean voices on the depressive slowness of “Spiritual Asphyxiation”, the keyboards that fill all the empty spaces on “On Antediluvian Shores”, and some aggressive parts, and the contrast of clean and shrieked vocals presented on “Alive in a Sea of Dying Flowers”. It’s an album hard to be assimilated, I’ll not lie. 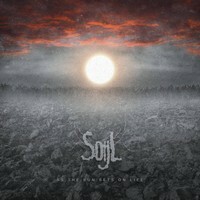 But “As the Sun Sets on Life” is really very good, and SOIJL is a good name in the Doom/Death Metal scene.